Having a gluten free Thanksgiving is very possible, but will require some pre-planning and coordination. Family holidays are filled with memories and traditions. Families look forward to certain dishes, that have become a tradition in their homes, for this day. It may be the only day all year that some of these particular dishes are served. If you are hosting the meal, then you will be in control of what is in your kitchen. In this scenario you simply have to do your shopping and make meals that are safe for you. If others wish to bring additional dishes that have become a family favorite, they can prepare them at home and bring the finished dish. As long as you avoid eating it, or using the same serving spoon, you should do fine. If you are willing to prepare a dish containing gluten, just remember to use items that are not set aside for gluten free use, like colanders and graters. Aluminum foil can help with some baking pans, and toaster ovens. The best way to handle these dishes, that you would not be safe in eating, is to keep them at the other end of the table. That way you are much less likely to use a utensil that was in the forbidden dish. Children who cannot partake should also be at the other end of the table from those dishes that are not gluten free. Things like turkey stuffing, for example, can either be made gluten free or made in a separate dish, not in the turkey. If you are preparing the dish, use a pan that will be easy to clean, like glass. Pies and cakes that others bring will belong at that far end of the table. Be sure to have a dessert prepared for the gluten free family members that can be enjoyed at the same time. Serve them first, to avoid cross contamination. 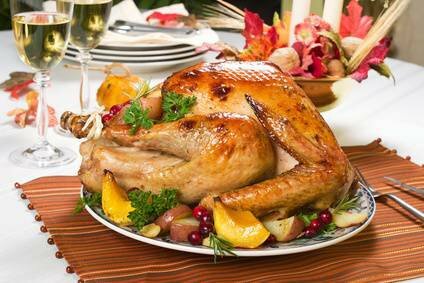 All Norbest Turkey Products (fresh and frozen) are gluten free. They also say none have dairy proteins (casein). The Norbest Oven Roasted Fully Cooked turkeys are gluten and dairy free, but do contain soy protein. All the raw turkeys have no soy. You can choose between fresh or frozen, basted or natural. Butterball turkeys (fresh or frozen) do not contain gluten, and their gravy packets have been reformulated so that they don't contain gluten. However, some packets still may contain gluten. If so, it will be listed on the ingredient statement, along with other top allergens. If you choose this brand be sure to check the label. Try to avoid those with gluten in the gravy packet. I've had the packet break in a turkey in the past (different brand though). There are 2 products Butterball makes that do contain gluten, Frozen Italian Style Meatballs, and Frozen Stuffed Turkey. Jennie O FRESH Turkeys are gluten free, but they recommend you read the label. Read the label for any gravy packet as well. Honeysuckle White Turkeys, Fresh, Frozen, or Cooked are gluten free. They do recommend you read the label. They have 5 products that DO contain gluten, Asian Grill Marinated Turkey Strips, Teriyaki Flavor Turkey Breast Tenderloin, Frozen Italian Style Meatballs, Fresh Italian Style Turkey Meatballs, and Beer Smoked Turkey Brats. Ocean Spray cranberry sauce is also gluten free. If you are going to a family member's home for Thanksgiving, things become a bit more complicated. You must be proactive, and ask them what brand of turkey they will be using. Make sure they are not putting a gluten filled stuffing into the bird. Ask if they could make the stuffing in a separate dish, so it does not come in contact with the bird. Most people who are new to the diet, will not understand about cross contamination. They may feel that a few crumbs or a couple of tablespoons of flour in the gravy will not harm you. Only you can judge how willing they are to work with you so that you can be safe. If you are unsure, the best option might be to bring your own side dishes. If they can make the turkey gluten free, and you can be served before others, then you can just bring side dishes for any gluten free family members. Many dishes will have something added that the hostess may not even realize has gluten in it. If you can get a list of ingredients for the various dishes you want to enjoy, you may be able to have at least some of them. Expect desserts to be off limits in most cases. Bring a gluten free dessert that everyone can enjoy, and serve your gluten free family members first, then it can be passed to others. Remember that many salad dressings also contain gluten. Bring one along that you can use if needed. The traditional green bean casserole is not gluten free. Campbell's mushroom soup contains gluten, and French's Onions contain wheat flour. So unless you make a gluten free version, that will not be an option for you. While food is an important part of a holiday, it is not the most important part. Being together, catching up on each others news and lives, and spending time with one another is the really important part. A little proactive planning can avoid tension and worry. Below are a couple of pages you may find helpful after the holiday.